Ryoko Nishimura is a Japanese flower artist based in Kyoto city. She stays true to ikebana with a long history in Japan. In 2012, she held flower exhibition with the concept of ikebana on a stream used to be a canal in Kyoto to bridge the gap between the traditional ikebana and modern lifestyles. In 2015, it was held flower exhibition on a canal in front of Amsterdam national museum with a support of AFK”Amsterdam found if Kunst(=Art)”. The flower work extended over 60 meters with roses, peonies, and hydrangea. It appeared in some newspapers there. After back to Japan, she decided her two missions. First, telling ikebana with authentic styles with true history. Second, looking for a way to enjoy ikebana in modern lifestyles. Today, she holds not only an exhibition, gives lessons and lectures. I’ve held some flower exhibitions on street since 2012. Some people say “It’s not ikebana”. which hasn’t lost a step even today. traditional Japanese parlor floored with tatami mats. into diversity same as many countries after 20 centuries. where ikebana flowers should be decorated. How can I create ikebana on a canal in Amsterdam? with which I came up during my stay in Amsterdam in 2015. Now I know it is the key question to keep being an ikebana artist. in this country decreasing zashiki? One day, suddenly I hit on an idea walking on a street. streets go straight far away along canals. built in a grid pattern in the small area. There were elm trees along the straight long streets. They showed up on such street and old brick buildings. I can create ikebana flower on a canal in Amsterdam. we try to emphasize a beauty of the place. Flowers are ground not figure. Come to think of it, it’s not only a talk about zashiki. creating flower work which can make the place more beautiful. Flower exhibition “United Flowers in Amsterdam” got a big success. 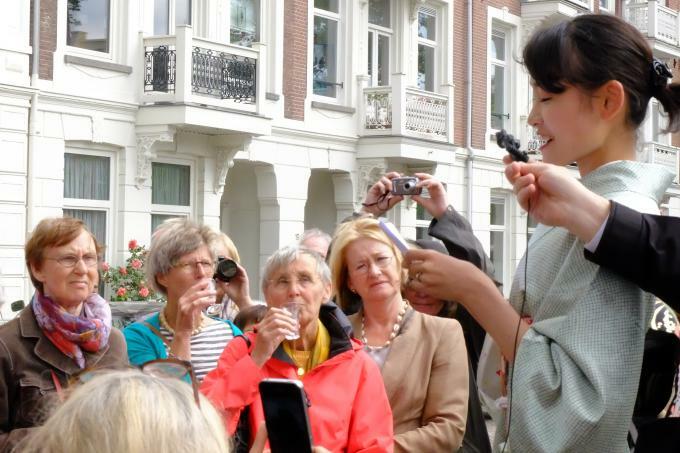 More than a hundred people in Amsterdam came to the opening ceremony included Japanese ambassador. -Telling ikebana with authentic styles with true history. - Looking for a way to enjoy ikebana in modern lifestyles. Copyright © 西村花店 Flowers ＆ Words All rights reserved.